Alan Tyers writes Despite what is being widely opined, I think the biggest mistake England made at the WACA was not bowling too short at Michael Hussey (if they believe that getting him out to the half-tracker on 116 was a vindication, they should all be severely punished). It wasn’t the failure to play Mitchell’s suddenly rediscovered inswinger. It wasn’t even the inability to stop the rot once wickets started to fall. England’s major error was definitely trying to sledge Australia. Like they say, “Never argue with an idiot, he will drag you down to his level and beat you with experience.” When it comes to being rude, abrasive and over-competitive, your Aussie cricketer is simply in a different league to his English opponent. Clearly a decent lad like Jimmy Anderson is never going to win a nastiness contest with the likes of Peter Siddle and Brad Haddin. These guys list their favourite cinematic moments as “When Bambi’s mum got shot”. Their idea of polite company is waiting for the lady to break wind first. England were wrong to compete, and I hope that, come Melbourne, we get back to doing what we do pretty well: being good at cricket, and leave all this macho willy-waving to our Antipodean cousins. 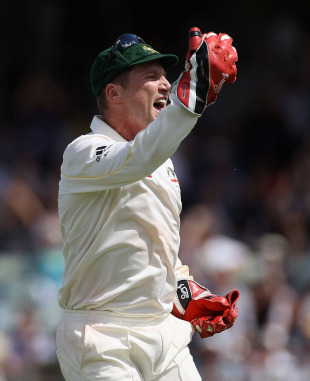 Jarrod Kimber writes Oh no, it wasn't the sledging. It was beauty killed the beast. The sledging just comes on the rare occasions when the stars align and Mitchell Johnson finds his inswinger. The most elusive beast in world cricket. Until this Test I’d met people who didn’t even believe it existed. Some of the English players kept batting like it didn’t exist. This Australian team is not made of sledgers. Mitchell has a gormless face that just can’t sledge. Michael Clarke’s dainty body is not built for vulgarity. And Mike Hussey cries if he hurts someone’s feelings. Australia are just louder when they win. That is why they have a reputation as sledgers, because they’ve won so much over the years and the losing sides have misconstrued this well-meaning chat as vicious sledging. Anyone can shut up an Australian, they call it winning. Alan replies If the Aussies really did only sledge on the occasions when Mitch has got his bowling boots on the right way round, they would be the quietest, politest nation on earth, a whole team filled up with the shy maiden aunts of Trappist monks. Now that they have finally won a Test match, they’ll be louder, all right. But I still think that this Australian team are never more than half-a-dozen overs of things not running their way from going quiet, sulking, standing with their hands on their hips, or to pick an example entirely at random, losing their rag completely when run out by a substitute fielder. Jarrod replies As keepers of the cricket flame of integrity, Australians do get angry when the opposition flagrantly push the spirit of the game with things like Bodyline, Arjuna Ranatunga’s runners and super subs. It’s just a shame that when Australia win, sledging is mentioned. As a people we are largely a quiet and shy bunch who just want what’s best for cricket - another Australian victory. Something England has done their best over the years to ensure.